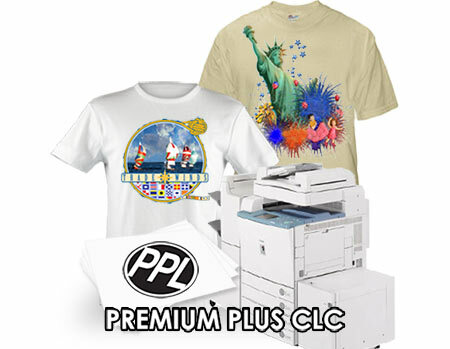 "Premium Plus CLC" Heat Transfer Paper - For Dry Toner Color Copiers & Color Laser Printers that use fuser oil. (For white & light color shirts). This hot peel heat transfer paper was designed to work well in Canon, Xerox, Ricoh & most brand color copiers that use fuser oil as well as desktop color laser printers with a dry toner ink system such as Xante Colour Screen Writer & most (but not all) Minolta/QMS models, etc. This heat transfer paper is not to be used with "fuser-less oil" laser printers such as the HP brand. If you are not sure if your printer has a fuser oil section we recommend going the manufacturers website to obtain this information. If you cannot obtain the info select one of our "Non-Oil" heat transfer papers. "Premium Plus" is a matte finish hot peel heat transfer paper. It will transfer onto almost any fabric, including polyester, cotton and 50/50 blends. This transfer paper works extremely well on Mouse Pads, T-shirts, Sweatshirts, Hats, etc. Must be applied by Heat Press only! Instructions | Transfer Cutting Tips!